Posted on July 5, 2011	by Lou Murray, Ph.D. I managed to harvest 224 lbs of fruits and vegetables last year with just the home garden (with 3 small raised beds, a couple of tiny patches in front, several grow bags in the driveway and my fruit trees). 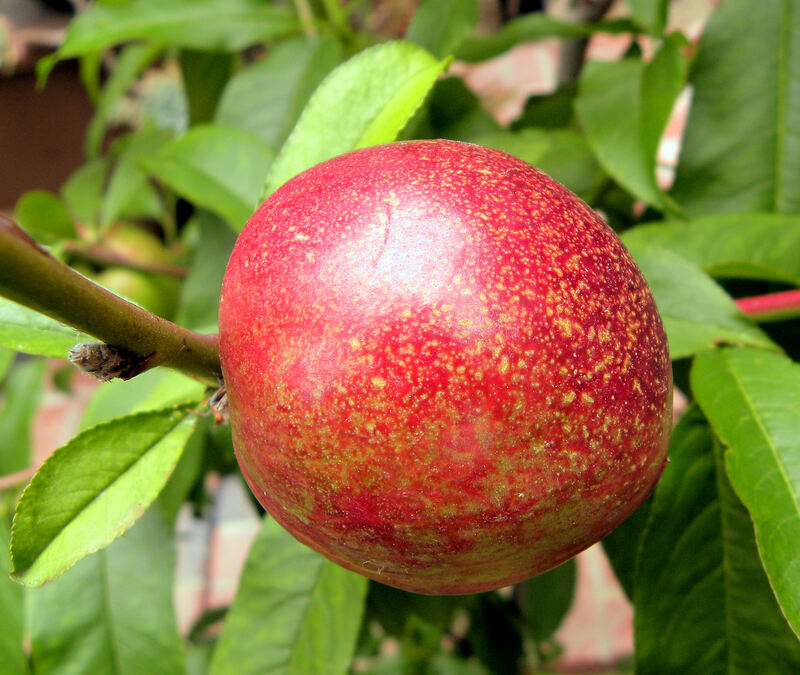 My fruit trees are reaching maturity and I have the new 14 ft x 20 community garden plot to provide more food. I had hoped to grow 500 lbs of produce this year. 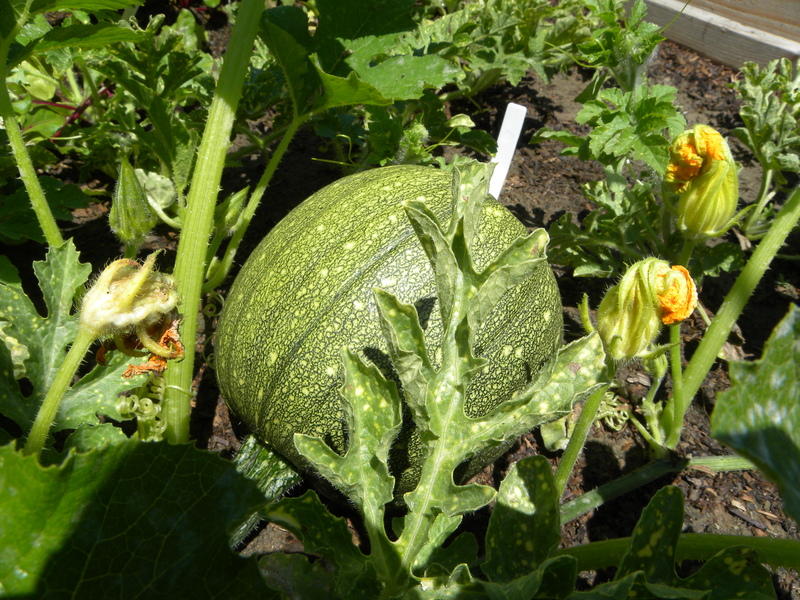 I decided to make a mid-year assessment now that the community garden is finally beginning to provide some produce. I wanted to see how this year was stacking up compared to last year. The picture isn’t pretty. This is the entire peach crop from my August Pride peach tree. Four peaches. When I compared total harvest poundage for the first six months of this year versus last year, I found that I’m actually behind my harvest of last year by many pounds. Sadly, the night critters have eaten almost all of my peaches and nectarines and every last one of my plums and apricots. I’m at least 20 lbs lighter in the fruit harvest this year compared to last year. They weren't even big peaches. 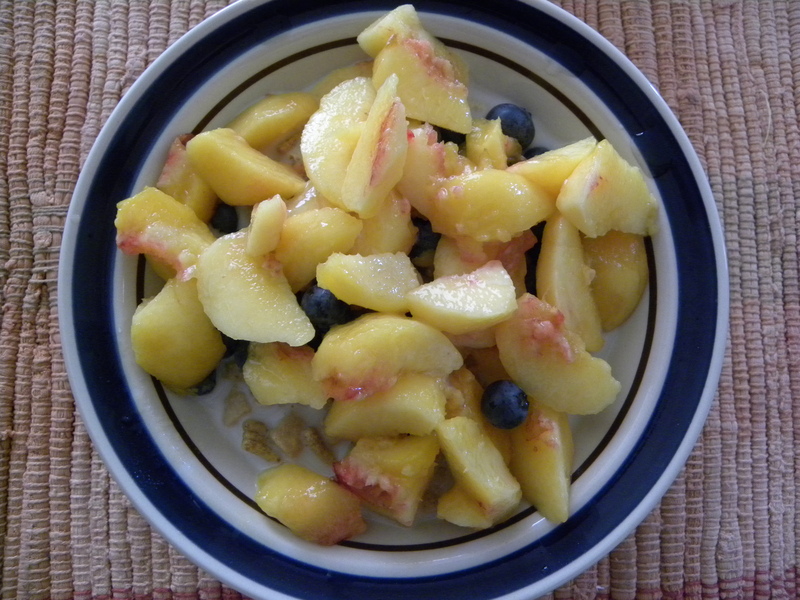 The entire peach crop went into one bowl of cereal along with a handful of blueberries. By the end of June last year, I had harvested 1378 ounces (that’s 86 lbs and a few ounces) of fruits and vegetables combined. With my new community garden finally producing, I was hoping to have exceeded that this year. Not even close. The combined harvest by end of June this year was a mere 1105 ounces, or 69 lbs. Bummer. 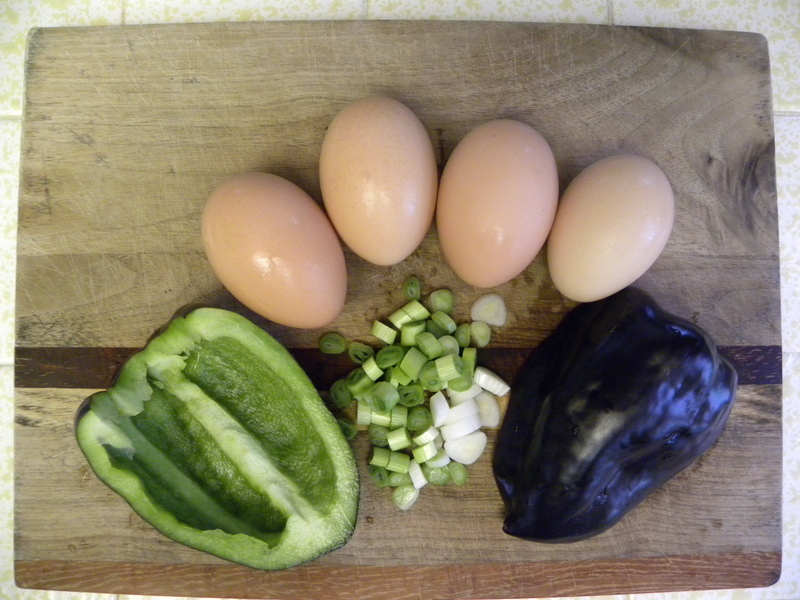 A black bell pepper and a green onion, plus four eggs, makes breakfast, all homegrown. Well, the bulk of my harvest last year was in July, August, Sept, and Oct, so here’s hoping I can catch up and even exceed last year’s harvest. But I’ve adjusted my goal for the year way down to a mere 300 lbs. I’m growing mostly heavy things in the community garden, things like corn, watermelon, winter squash, tomatoes and pumpkins. But the dingdang rabbits are eating everything. Edison made us take down our wire fences, which were rabbit-proof. The replacement plastic fences provide no protection from the bunnies. They chew right through the flimsy plastic mesh. Don't let the watermelon leaves fool you. 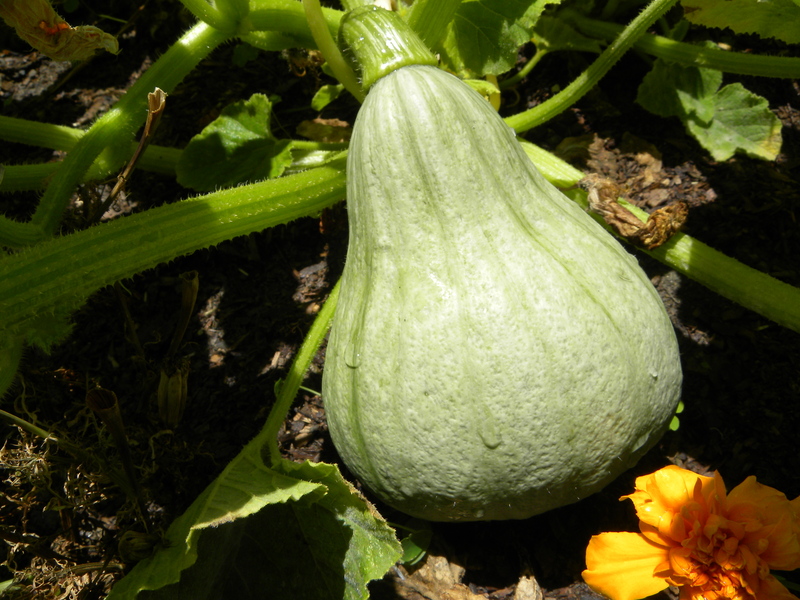 This is a pumpkin that is growing in my watermelon patch. Vines wander, what can I say? I'm pinning my harvest weight hopes on big things like this that don't seem to be attractive to the bunnies. 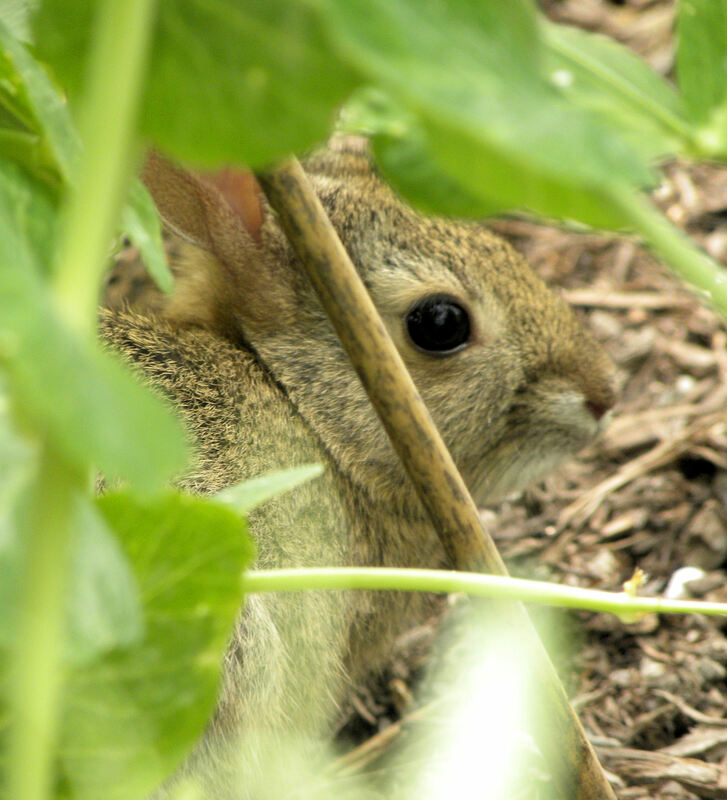 One little bunny actually lives in my garden. It only hops out when I’m there watering. The rest of the time it helps itself to my wax beans, nibbling the bottoms off each one. It eats the leaves off the bottom of the eggplants and the tops of the chard plants. Either the bunny or an itinerant possum is eating the tomatoes as soon as they become pink. It’s really frustrating, especially since I spent nearly $1500 on lumber, fencing, soil amendments, a bench, spray nozzle, etc. I have a half dozen mini blue hubbard and red kuri squash, but they're miniature. Each one will provide a scant two servings, assuming that they survive until harvest time. 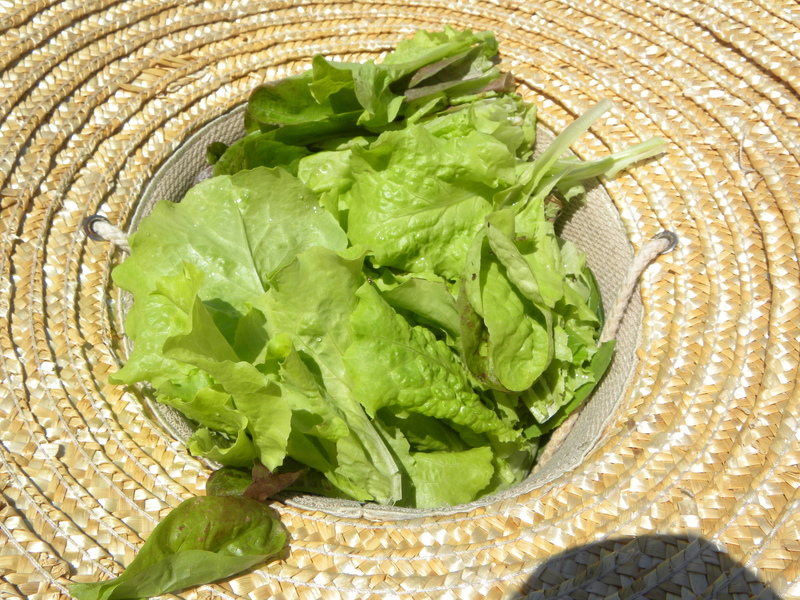 I harvested a hatful of mesclun, lovely little lettuce leaves that the rabbit doesn't seem interested in. Go figure. But lettuce doesn't weigh much. My community garden plot looks fine, but still isn't producing much. I get wax beans, at least those that the rabbit doesn't get, and radishes. That's about it so far. The summer squash seem to have stopped producing almost as soon as they started. The tomatoes are stunted because the soil is so impossibly compacted just a few inches down. This used to be a gravel parking lot and despite all the expensive soil amendments and fertilizer that I added, it still isn't growing all that well. Aw, isn't the baby bunny cute? I wish I could KILL it. Or at least fence it out. Edison (the landowner) now wants us to remove all fencing, so the gardens may be doomed. They also want us to remove all trellises, the portapotty, the dumpster, etc. It's almost like they're asking us to leave. Maybe that will be the next edict from them. We are not happy gardeners. This is HALF my nectarine harvest this year. Two lousy Snow Queen nectarines and NO Panamint nectarines. Can't believe how much the night critters got this year. 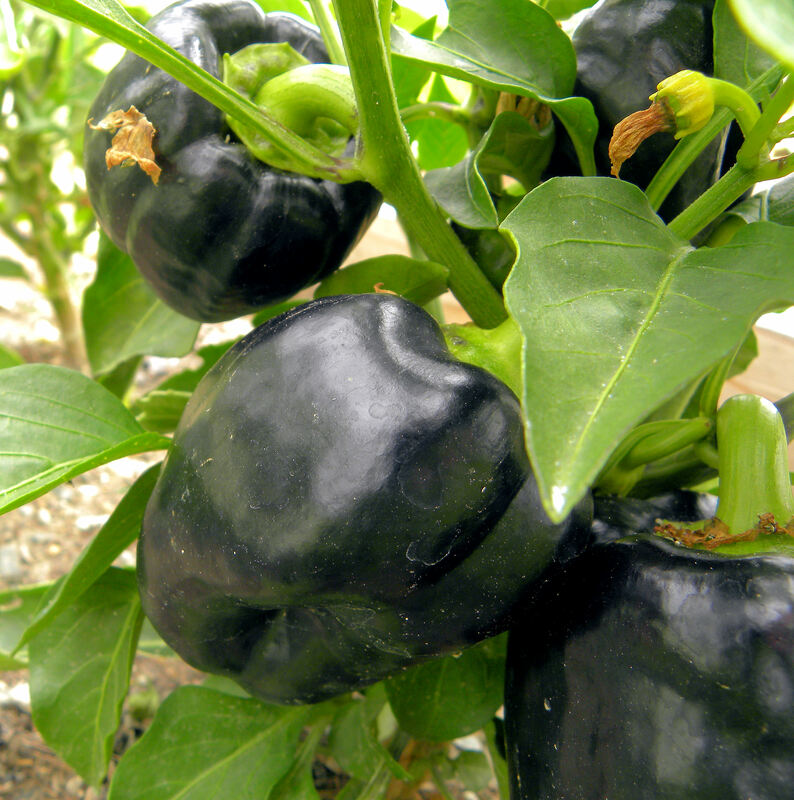 So far the bunny has ignored the bell peppers and I've been able to harvest two of them. The bunny also ignores my Texas Sweet and Southern Belle onions. I've harvested a number of them so far, with about 28 still growing. 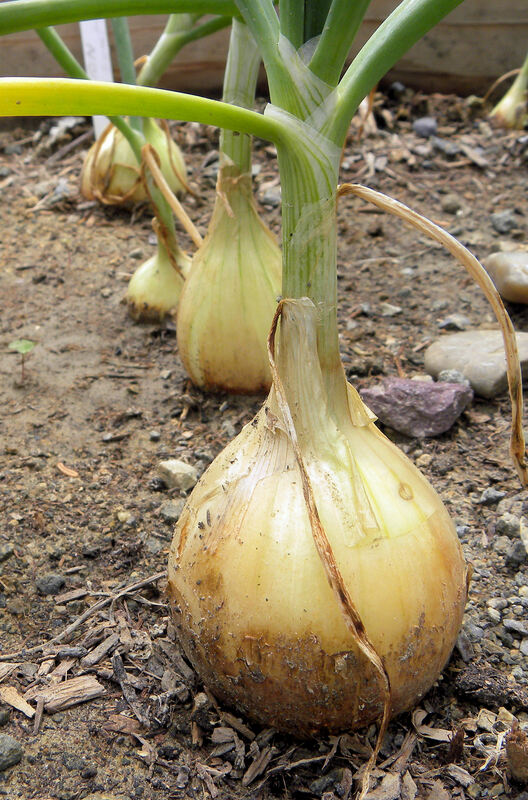 The garlic crop appears safe as well. OK, I'll quit belly-aching. I'm getting some produce. 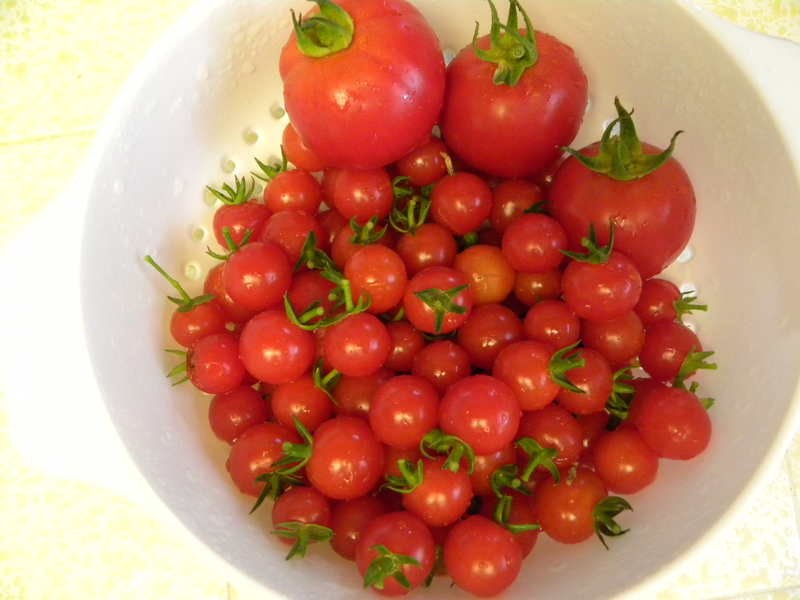 I have a Sweet 100 that is producing more cherry tomatoes than I need or want. I don't know why I planted it, because I don't like cherry tomatoes. But it gave me tomatoes weeks before any other plant did. Those are a few Early Girls in with the cherry tomatoes. Some of these photos are from last week’s harvest. 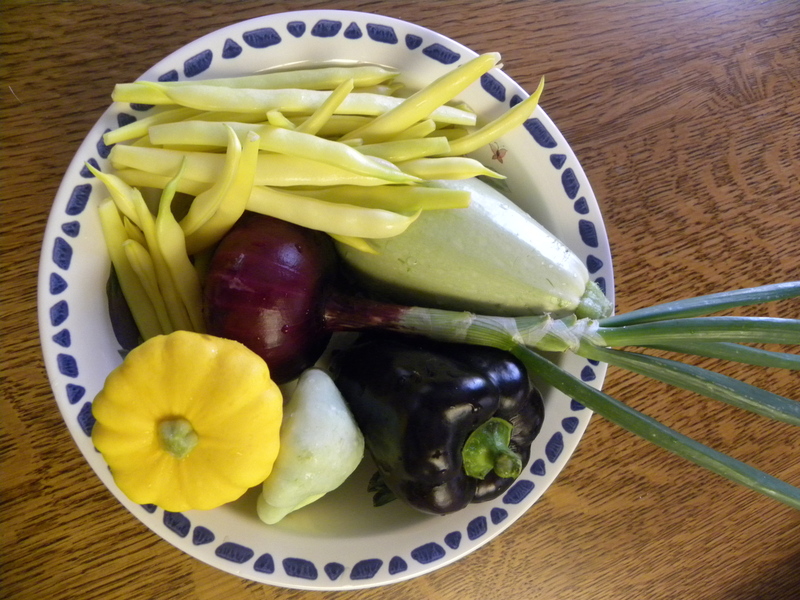 I haven’t been very good about keeping up with blog posts, but I have been logging in the harvests in my garden diary. Here’s what I got last week. Oh. Well that wasn’t as bad a harvest week as I thought. Maybe there is still some hope for the season. Visit Daphne’s Dandelions to see what others are harvesting. KitsapFG, the ding-dang bunny has made my garden my home. From there it goes on raiding forays into other gardens. I'[ve repaired that useless plastic fence nine times already and nothing deters that determined rabbit. The rats have devastated my home garden. I’m about to add up how I’m doing in pounds of harvest up to August 1, but I don’t think this will be a banner year. 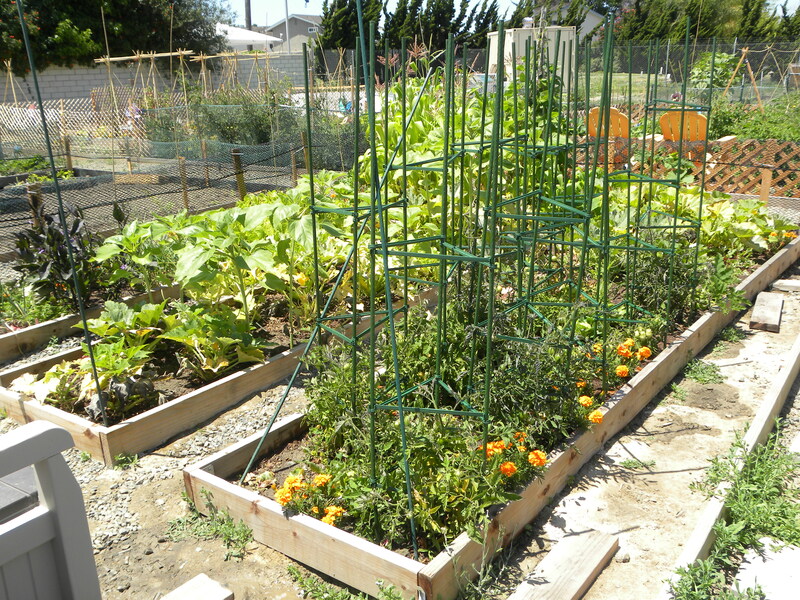 As for Southern California Edison, they had an entirely different mental image of what a community garden would look like. They had never heard of raised beds. They thought we would all garden directly in the “soil,” but what they gave us was a gravel parking lot that had been heavily compacted by heavy equipment. They also didn’t plan on fencing. Well, neither did I. But the rabbits made it necessary. I thought your harvest looked delightful! 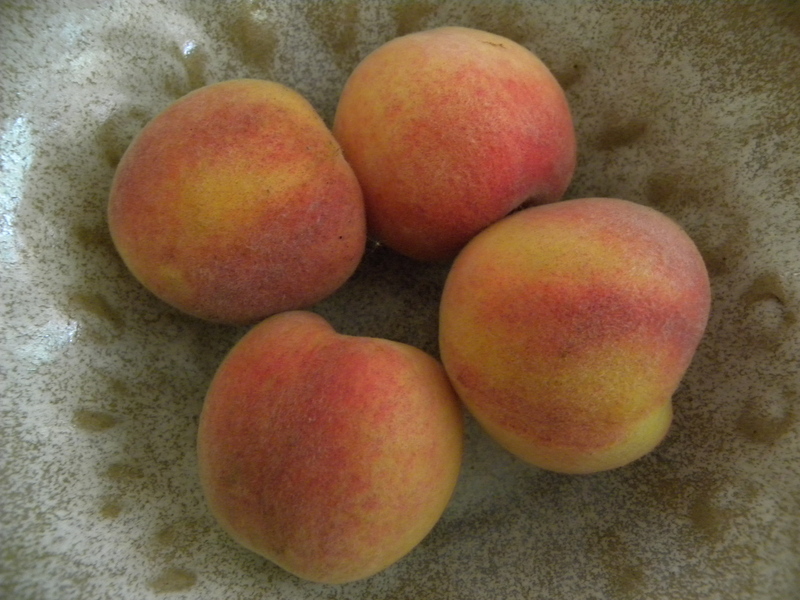 I wish I had some tree ripened peaches, even if only four of them. My total is also way behind last year, and there will be no chance to catch up. I didn’t plant the heavy things like potatoes, and my squash is so late it may not even give me a crop. My garden suffered from cold weather and slugs early on, so I’m just thankful I’m getting anything at all. Annie’s Granny, it’s been cooler here too. My summer squash plants seem to have given up the ghost. I’ve added mulch and fertilizer hoping to revive them before the season is over. It’s a challenge. I can’t kill them either. And they are just too cute, but we finally built a fence that they have not penetrated…yet. I hope it stays that way. I hope you don’t have to take your fence and trellises down…good luck! Hi Sage Butterfly. Welcome to my blog. I agree that the bunnies are too darn cute to kill. They just make me mad that they’re eating everything. As for that plastic chicken net fencing, the bunny has gone through it nine times now. It makes a new hole whenever I patch the old one. It’s frustrating. Clare, I’m shocked at your low tomato fruit set so far. Now I don’t feel so bad about my greatly decreased tomato crop compared to last year. At least I’m getting some. Geez. Why did they let you have a community garden there if they wouldn’t let you have a community garden? I can understand them not wanting metal in the garden, but not even plastic or wooden fencing and not trellises? Ah well I guess you live with what you can get. Your harvest looks lovely. And I’d eat your cherry tomatoes. I love them so much. I put a bowl of them near my desk and just nibble on them. Hi Daphne. I think the issue is that Edison was picturing gardens in the ground, with no fencing, no raised beds, and no trellising. Our garden board is working with them to come up with what is acceptable and what isn’t. But I can tell you that the plastic chicken netting is totally ineffective against a determined bunny. It has chewed nine successive holes in the fence to get to my garden. We just got approval for plastic trellising to be used as 2-ft-high fencing, so I’m going with that.